The question “What is your favorite Beatles album?” is such a cliché among music fans that I hesitate to use it here. 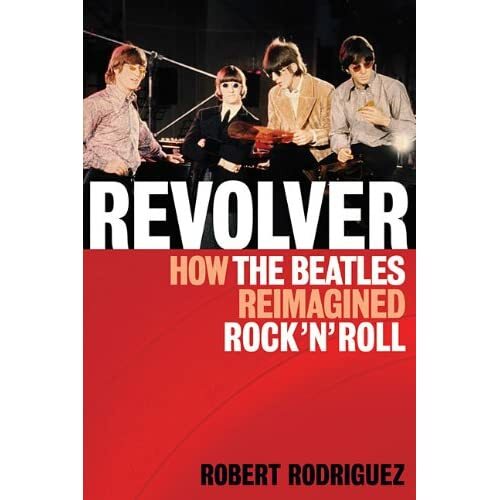 But since the whole point of the new book Revolver: How The Beatles Reimagined Rock ‘N’ Roll by Robert Rodriguez is a variation on that (in)famous question, I just had to pose it. The funny thing about this question is that it is never intended to reveal anything about The Beatles. The query is about you, the fan, and what “period“ of The Beatles you prefer. In a way, it is the ultimate musical Rorschach test. Some people swear by Please Please Me (1963), which reveals a penchant for good, old fashioned rock and roll, unadorned by the later experimentations. To others, the experimental period of the band is the whole point. And there is a large fan base to whom the group’s final studio effort, Abbey Road (1969) bridges all the gaps, and is the one. I tend to agree with Mr. Rodriguez in choosing Revolver (1966). When I first cracked open the book, I expected it to be something of a track-by-track analysis of the album. And this would have been sufficient, as the 14 songs (on the original British edition) are all top-notch, and the stories behind them would have made for an intriguing read. And they do, but the author does not stop there by any means. Rather than being a simple study of the Revolver album, Robert Rodriguez does an excellent job of contextualizing it. Of the many Beatles books I have read, the authors invariably discuss their various recordings as if the band operated in a vacuum. The storyline is typically the growth shown from album to album, with well-worn anecdotes about the influences of Bob Dylan, The Stones, Brian Wilson, and drug experimentations, just to name a few of the usual suspects. After reading this Revolver book, I look back at many of these other Beatle books with a bit of a jaundiced eye. As Rodriguez points out time and again, there is much, much more to the basic Beatles story than what we have normally come to expect. For all of their vaunted success, the bottom line was that The Beatles competed for chart positions and radio airplay just like everyone else. With Revolver in 1966, there were genuine fears that they had “gone too far,” and the possibility existed that their audience would not follow them. It seems almost impossible to imagine such a scenario today, but this is what Rodriguez does best - putting the reader smack-dab in the middle of the pop-music landscape as it existed in 1966. For example, The Beatles released what I consider to be one of the all-time great double A-side singles in the U.S. on May 30, 1966 - “Paperback Writer” b/w “Rain.” It dislodged Frank Sinatra’s “Strangers In The Night” from the number one slot, where it remained for two weeks. Sinatra came back with a vengeance however, and reclaimed his top spot from them. In England, the single pried The Rolling Stones’ “Paint It Black” from the “toppermost of the poppermost for just one week, to be replaced by The Kinks’ “Sunny Afternoon.” Although there was never any real cause for alarm, this type of chart action is telling, and there was real competition for The Beatles out there. As I was a mere four year-old child when Pepper was released, I have no recollection of how eagerly anticipated that record was, or of how it became the de facto soundtrack to the Summer of Love. And without that misty, nostalgic haze clouding my judgment, it is pretty easy to compare the songs of Revolver with those of Pepper. With all of the attendant hoopla now scraped away, we can let the songs speak for themselves. And it is pretty hard to deny the fact that cut for cut, Revolver is simply a superior collection. 1966 was definitely a watershed year for The Beatles, and fittingly enough, it perfectly coincides with the mid-point of their recorded career. Please Please Me was issued in 1963, and their final studio effort Abbey Road appeared in 1969. Six amazing years, and a legacy that will likely never be approached in terms of shear artistic growth and cultural impact. I found Robert Rodriguez’s treatment of not only Revolver, but the attendant singles from 1966 to be both opinionated, and fair. He also offers up a few relevant facts about the albums that bookended Revolver, Rubber Soul (1965), and Sgt. Pepper‘s Lonely Hearts Club Band (1967). Real world context is what makes this book such a great read. Why nobody else has ever thought to discuss the group’s albums, and their position in the highly competitive pop-music marketplace of the bygone AM radio world of the 1960’s is beyond me. Maybe the accepted wisdom that these “mortal gods” were completely above such mundane concerns as chart positions accounts for this. But Robert Rodriguez’s genius inspiration was to ignore that pedestrian approach, and dig deeply into the real world of the mid-sixties pop music arena. Of the literally thousands of books out there about The Beatles, this one stands head and shoulders above the usual fare. Revolver: How The Beatles Reimagined Rock ‘N’ Roll is one of the more original takes on this band I have had the pleasure to read. My hat is off to you Mr. Rodriguez for telling this portion of The Beatles’ story in a very compelling manner. One final note which I cannot resist is a comparison between Revolver: How The Beatles Reimagined Rock ’N’ Roll to today’s most critically acclaimed television show, Mad Men. Almost every single review of Mad Men mentions the authenticity of evoking the sixties-era of three-martini lunches, dark paneled offices, and the ubiquitous cigarette smoking. It goes without saying that the plot-lines are complex and wonderfully written. But it would not be the same show without the brilliantly detailed ambiance of the sets. It puts you right there, some 45 years ago. This is the achievement Robert Rodriguez has managed to evoke with his 266-page discussion of The Beatles greatest album. And in the end, it is this quality more than any other which makes his the Beatles book of the year for me.